Ok, here is the finished afghan. I have 4 extra squares, so I purchased 2 - 12" pillow inserts that will have a square on each side. So she will have something to lay her head on. As soon as they come in, I will take a picture of the whole package. In the mean time, here is the afghan. 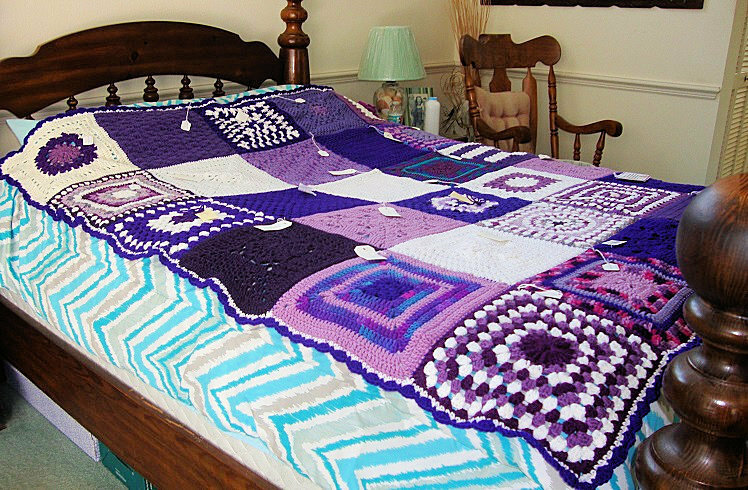 Every one has at least if not all their squares in the afghan. real pretty i like it nice j0b!! Mary Jo, it's just gorgeous ! 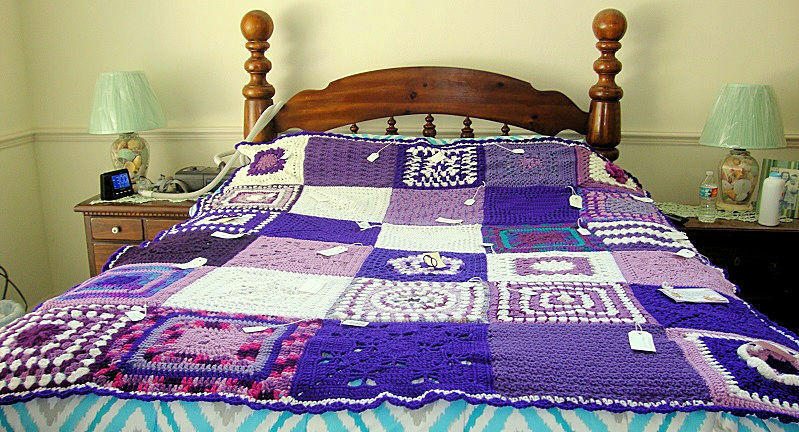 Thank you so much for putting this together -- both the afghan itself and the idea to do this. Awesome. It's very pretty! Thanks for coordinating and putting it all together. Mary Jo, It's beautiful. Thank you for putting it all together. Looks really nice. Great job! Wish I could have helped you sew them together! Now that I've learned the invisible seam stitch, I even enjoy joining!! You did an exceptional beautiful job joining and edging, Mary Jo! I just checked and the pillow inserts are in Tampa, so they should be here tomorrow. Are those pillow covers will be easy removable for washing?. I just started working on a owl pillow. I have a picture of that pillow few years. Never got around to make that until now. I am planning to sew buttons and make button holes on the other side. Because they will need to take that of for wash.
That pillow will be big 20"x 20". That is because I have at home two inserts of that size. I bought hypo allergenic pillows that can be thrown into the washer and dryer. I am not sure if I will leave them open on one side, or close them. The squares can also be thrown into the washer, so not sure. That's a tough decision - I'm guessing that if you can slip the squares off the pillow they would dry faster? What about closing the squares using a crocheted chain, looping it through the edges of the squares and tying it with a bow, so Terri can see where it comes off? Whatever you decide on will be fine! That type of closing what you are described I think that is called the "shoe lace" method, but I am not sure. When it comes to crochet pillows I have not done any before. I did many of them in my "sewing days" out of fabric. So I usiually sewn the zipper in, that was easy. Acording to me zippers & thick yarns do not work very well together. Neither is Velcro. When it comes to Velcro & any yarn their is a big NO! NO! :(. Once I got my brand new sweater destroyed at the doctor office from that cuff what comes with that blood pressure instrument. I was not happy! I was thinking maybe weave a ribbon through the side and tie with a bow. I think that would be pretty. The afghan is beautiful. You did a wonderful job. This will be a treasure for years to come. Thank you for all your hard work and for organizing this. I just clicked on that link above. That looks very nice. Those are crocheted button holes. The buttons are not crocheted. They have that wooden look. They could be made out of wood or even a out plastic looking like wood. They could even been oval shape beads or maybe they are buttons?. I think any of that would work well. I decided to crochet them all the way around. I will tell Terri, where I ended this, so if she wants, she can take them off and open one end. The pillows and squares can be thrown in the washer and dryer. I throw my throw pillows in the washer and dryer when they need it. Anyway, here they are. Also I got the last package I was waiting for, so I hope to pack this up and get it ready to go out tomorrow. Packing up tomorrow anyway. I will post the DC # when it ships. This is the package I was waiting for. It is an owl and broom doll from Apak. lovely pilloews and i love apaks goodies too! !